Swimming pool, Tree house for bird and game viewing, Treehouse sleep outs. Bar/deck overlooking a watering hole. 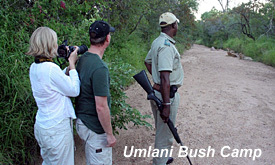 Bush walks, Game drives and Night drives in open game viewers. The camp is Off the Grid” however solar power stations are provided for charging camera batteries etc. 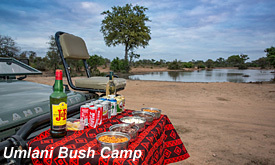 Rates include Accommodation, 3 meals per day, 2 x game drives, optional bush walks, all local brand drinks + 14% VAT.